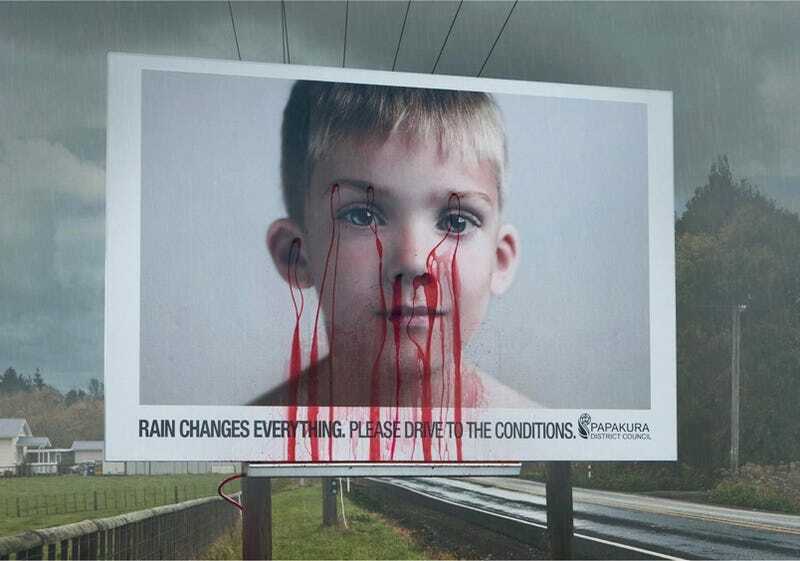 A billboard erected in New Zealand to remind motorists to change their driving to match weather conditions has a child's face that bleeds when it rains. Better yet, it ran during Easter and the Jewish holiday of Passover. The bleeding billboard was created to promote a safe driving campaign over the Easter and Passover holiday in which there'd been a sickening amount of fatal accidents in previous years especially in rainy conditions. Advertising agency, Colenso BBDO was tasked with the creation of the billboard that, when it rains, bleeds profusely from the child's face. Somewhat disturbing? Yes. Potentially culturally insensitive? Sure, maybe to Egyptians and Christians. But we're pretty sure we'd get the message. We're not the only ones. Since the billboard was erected, there's been a 0% death rate. That's a number they're happy to live with, we're sure.